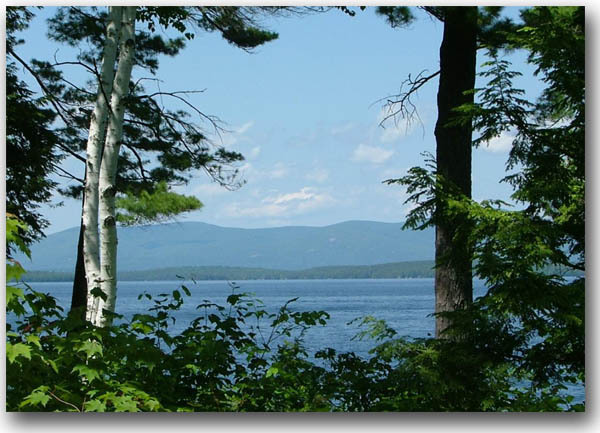 No worries for this fun family vacation on Lake Winnipesaukee in New Hampshire. The kids have the summer off, there are no commitments and definitely no errands that have to be done. It's our turn to enjoy the lake for a few days. So I thought I'd tell you about our weekend vacation adventures. Since we're not used to going away for a weekend getaway, packing was a challenge. I think we brought everything but the kitchen sink. I stocked up on food to last four days and packed a combination of clothes because the weather would be both warm and cool. When we arrived for our fun family vacation on Lake Winnipesaukee in New Hampshire, we opened up the cottage to warm it up and then tackled all the spiders and their webs. After we set things up the way we wanted them, the kids promptly went outside to enjoy the lake. While Dave paddled out to retrieve the sailboat from the mooring, I relaxed on the deck just enjoying the scenery and the fact that I didn't have to do anything. No laundry, no cooking and definitely no cleaning! My youngest daughter went out on the canoe with Dave so she could paddle it around while he set up the sailboat. Both girls decided to go in the water. They found some floaties, drifted around for awhile and then tied themselves to the mooring so they didn't float away. You can hear the laughter as they played fun games and jumped in the lake to cool off every now and then. The water was still a bit cold to stay in for more than a few minutes. After the sailboat was set up, we just had to try it out since it was ready to use. Sailing out to "the broads" on Lake Winnipesaukee and back was a nice little excursion. 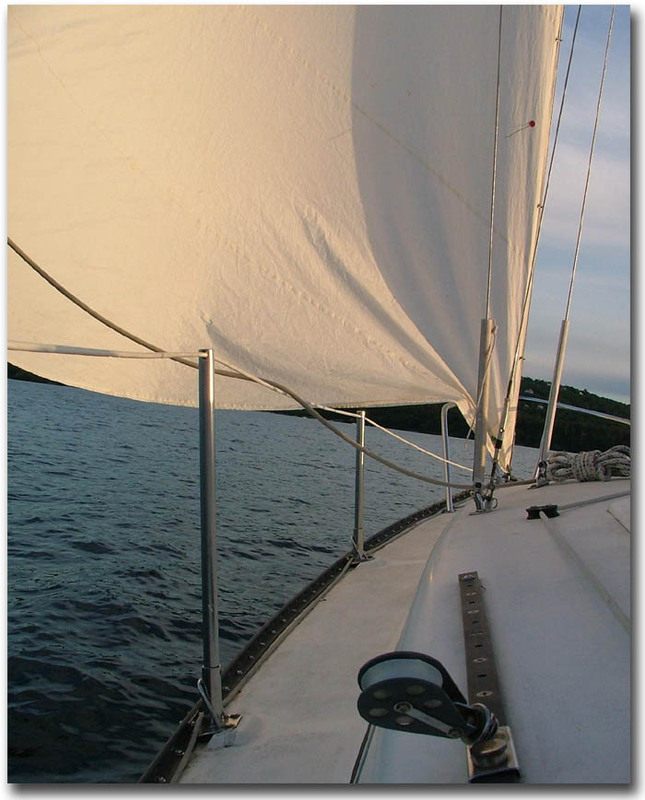 It's great to feel the wind in your hair, enjoying the quietness of sailing and the spectacular scenery. After dinner, we decided to go on a sunset cruise with the cousin's motorboat as part of our New Hampshire fun family vacation on Lake Winnipesaukee. Our boat is in the shop getting new "lifters" put in it. I'm not sure what they are, but they're supposed to make the boat perform better. As we headed back, it became noticeably warmer. There was an outdoor wedding nearby, so we stopped to enjoy the music from the lake. We danced to the last song in the boat under the full moon and headed in. It was very late, but we wanted to see a star or planet that was just left of the moon. My daughter was right, there was a star there that "we" couldn't see with the naked eye, but young kids could. We tried binoculars, as well, but it was too bright and hurt the eyes. It's funny, the full day of doing nothing on our fun family vacation made us very tired. Dave won't agree that it was relaxing because he sharpened the mower blades, mowed the lawn, fixed the sailboat lights and who knows what else. The next morning was a new day. The sun shining through the blinds woke me up early. I left everyone sleeping and went out to take some pictures. After I was done, I sat on the deck with a cup of tea and listened to the birds and watched the ducks on Lake Winnipesaukee. What really thrilled me was to have breakfast out on the deck. At home, there are so many mosquitoes that eating out isn't fun. 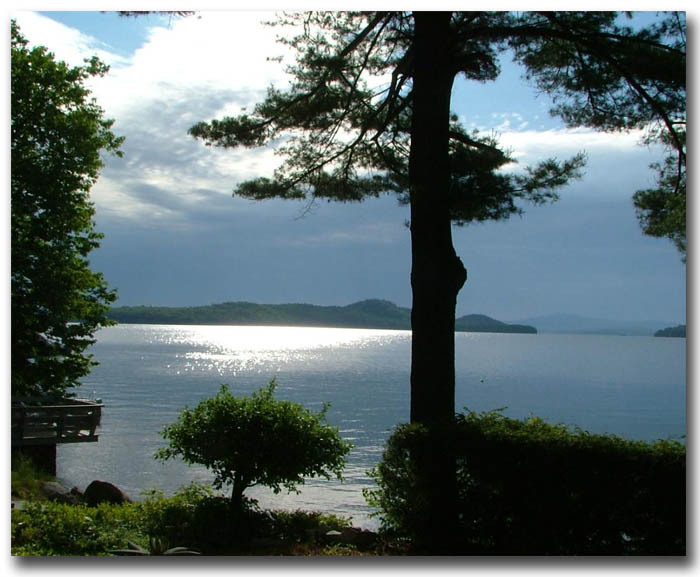 The second day of our New Hampshire fun family vacation on Lake Winnipesaukee proved to be just as relaxing. Dave will differ on that point as well, because he and his brother put in the dock and raft. The girls did some more floating around and I read. The weather did get a little cloudy in the evening, but that didn't stop us from enjoying ourselves. That evening we went to see the Lakes Region Big Band play at Patrick's Pub. Dave played the clarinet and saxophone in the Lakes Region Big Band. Did I forget to mention that Dave is also a musician and plays in several bands in the area? We met some friends and listened for awhile. While Dave was playing, we thought it was a good opportunity to go home and feed the fish. We only live 15 minutes away. We arrived back at "the camp" just before Dave did. Another beautiful day was in store for us. This time Dave was able to enjoy it as well. There was a light breeze and we took the opportunity to get some sailing in. We headed southeast and then around an island. Guess what? We ran out of wind!! After a few more tacks of going nowhere, we decided to motor in because we were all hungry. There was still much of the day left with the beautiful sunshine and blue skies for our fun family vacation on Lake Winnipesaukee. Off to Wolfeboro, we went. We borrowed the cousin's boat again and cruised on over to the other side of the lake. There's this great little shop called Black's. We just love going in there. You can find all kinds of neat things to buy. There's toys, t-shirts, figurines and so much more. After walking around for awhile, we headed back to camp. In the meantime, the breeze picked up again. It was a perfect night for sailing. After dinner, we went out for a sunset sail. Off in the distance, there were storm clouds. Actually, it was four days worth of rain on its way. The wind was light, but enough to move us out to the broads and back. 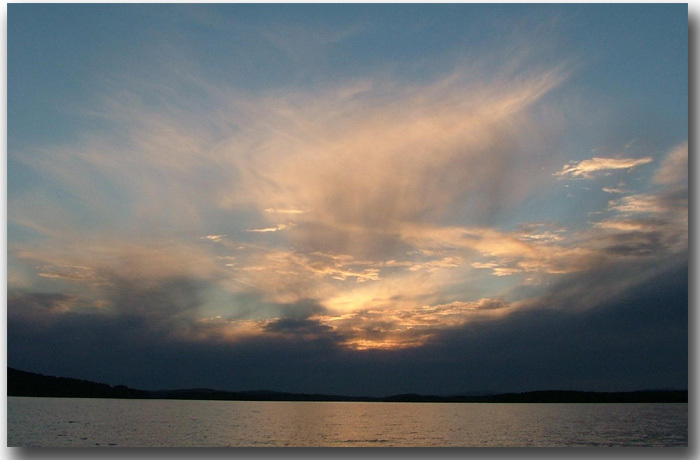 Usually, storm clouds bring beautiful sunsets and I was hoping to snap some great pictures. But the sun was still too high in the sky when the clouds took over. I did get a few pictures. We'll just have to plan on doing this again so I can get more. 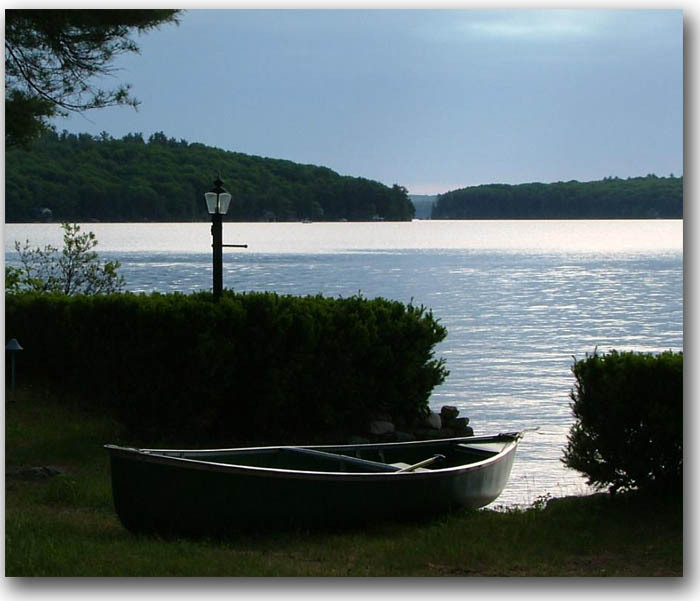 Believe me, this was the perfect fun family vacation as a weekend getaway on Lake Winnipesaukee in New Hampshire. It was thoroughly enjoyable and we want to do it again. Back From New Hampshire Fun Family Vacation to Lake Winnipesaukee Vacation.